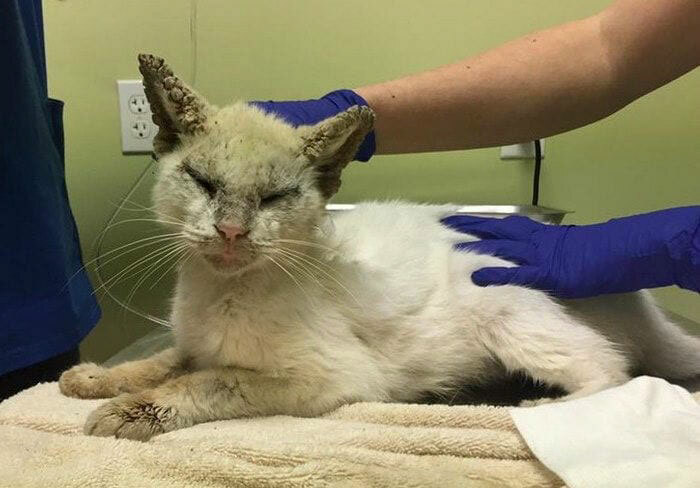 Like many other strays, Cotton was wandering the streets, starving and fighting the odds. 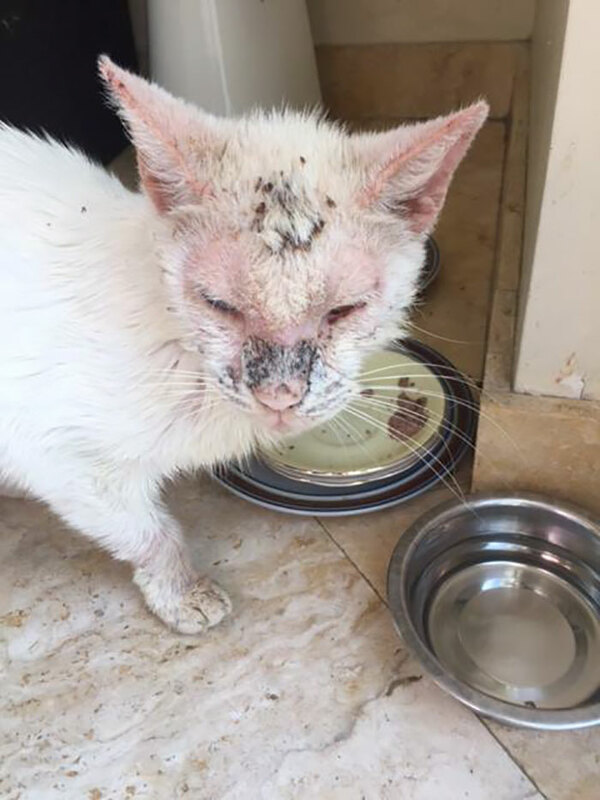 Cotton suffered from mange and mites, which was the reason his eyes were permanently shut, meaning that the cat starved, unable to find food. The founder of Animal Friends Project – Carmen Weinberg – saved the cat before it was too late. 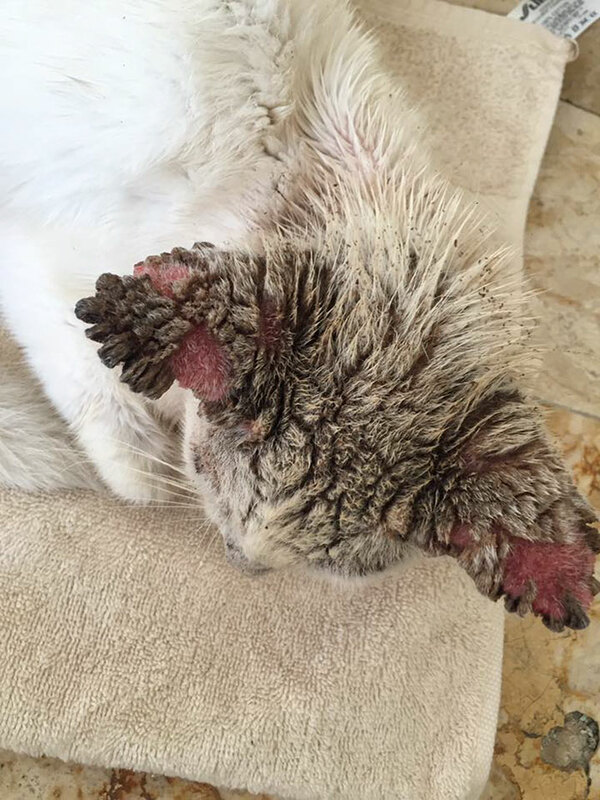 Cotton was in a really bad shape and Weinberg immediately began treating his condition. What nobody expected is the full recovery of the cat and the surprise he had for them as soon as he opened his eyes. The sick cat looked miserable and this is probably the way he felt, too. Due to the mites he was unable to open his eyes, and he was probably like that for several months. 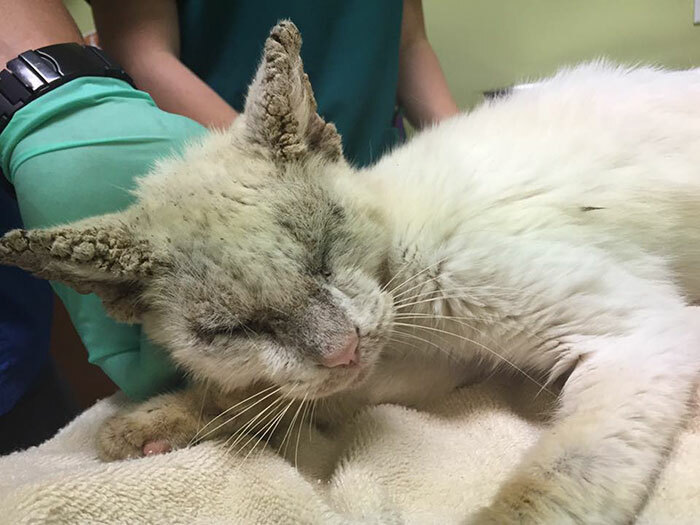 Being unable to see, Cotton had a tough time finding food on the street, and nobody was there to feed him of take care of him until he was rescued. 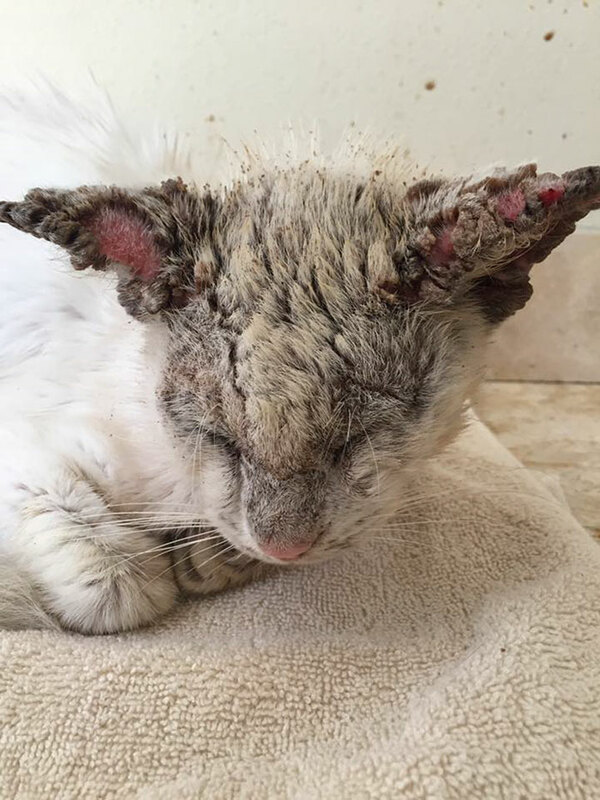 We cannot imagine what the cat went through while wandering the streets alone. The disease got the better of him and made it almost impossible to survive. Still, Cotton proved to be strong enough to endure until he was finally brought to safety. The cat could barely stand on its feet because of the almost constant starvation. As you can see, the appearance of the poor animal clearly speaks of its severe condition. 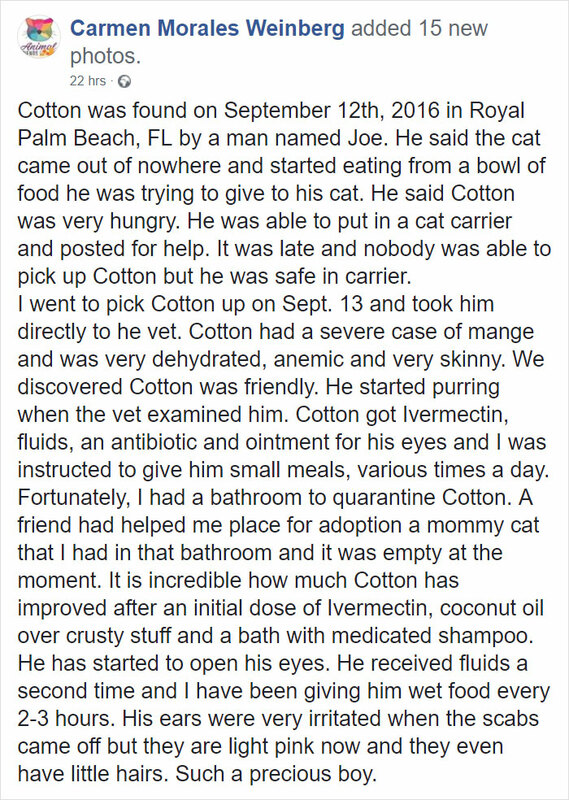 Cotton was really lucky to be found and taken care of before it was too late for him. After the cat was picked up, the first thing on the to-do list was to give him a proper bath and to disinfect him. He was also fed and continued to enjoy regular healthy meals in order to regain his strength and to be able to recover faster. The mange was also treated with various different substances. As soon as the procedures started, the cat showed signs of relaxation. The tension he had in his body faded away as soon as he felt the cares of the people who found him. The meals and the different creams and coconut oil used to treat his mange certainly helped with that. He probably never knew what such cares felt like before. 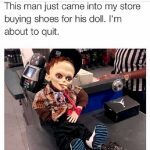 Cotton really suffered for a long time and it was a matter of time before the disease got the better of him. One look at his ears can show you how bad things actually were for him. Unfortunately, he is not the only stray cat that suffered this kind of faith. If you see a kitty n distress, you need to do what it takes to take the animal to the vet to be treated. We believe that most people would definitely pass Cotton and the other cats in his state because of their looks. Everyone would pet a fluffy and clean cat but they are not the ones that need help the most. 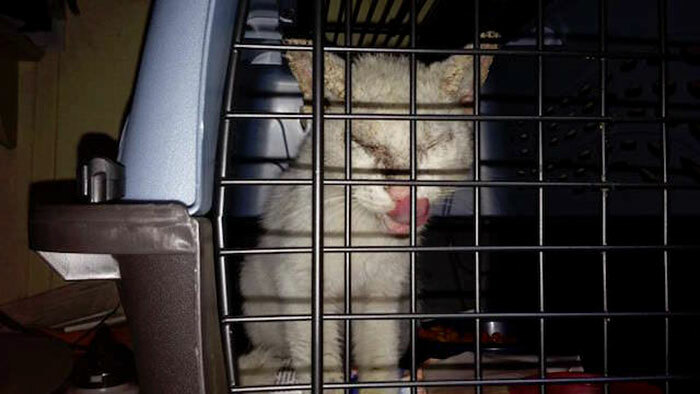 However, there are kind and compassionate people who will not hesitate to help an animal in distress such as this cat. Having the right meals and a day to day treatment proved to have the needed soothing effect on the way Cotton felt. He took his time to rest and the people who took care of him knew that he will not recover as fast as they would like him to. 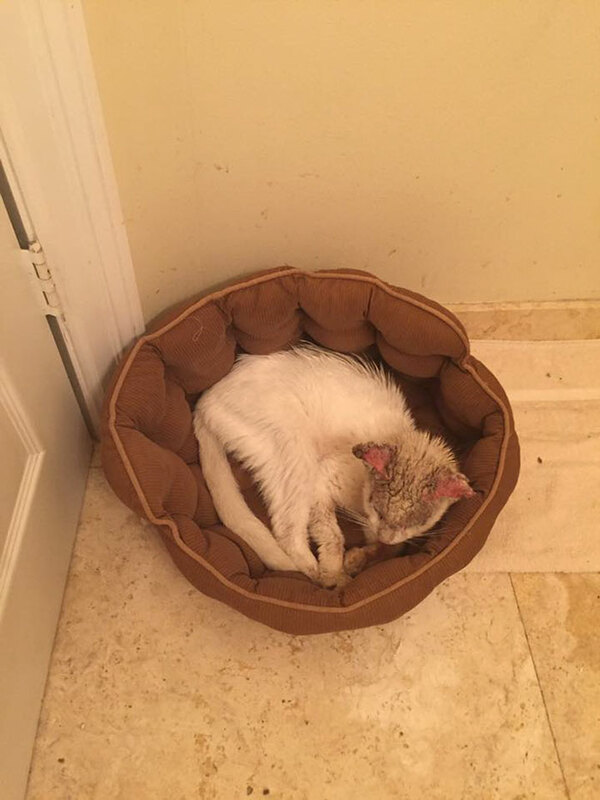 Except for the medication, antibiotics and treatment procedures, Cotton received a lot of attention and also had the chance to relax and enjoy his warm bed for as long as he wanted. This was among the main factors for the success of his healing process. Everyone likes to feel loved and the cat probably realized that he was being taken care of. We guess that this image shows how Cotton changed compared to the first images showing his state upon his arrival. It is also clear that he became stronger and leaner which was the result of a strict diet giving him all the nutrients he was missing to take for months. A man trying to feed his own cat actually found Cotton, who smelled the food and came out of nowhere. The man put him in a carrier cage after that just to make sure he was safe. He posted a message seeking assistance with the cat because he was not able to do much more for him. When he was brought to the vet, Cotton showed his friendly nature and purred with satisfaction. 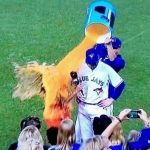 He probably enjoyed the attention and care he received, because it was new to him. 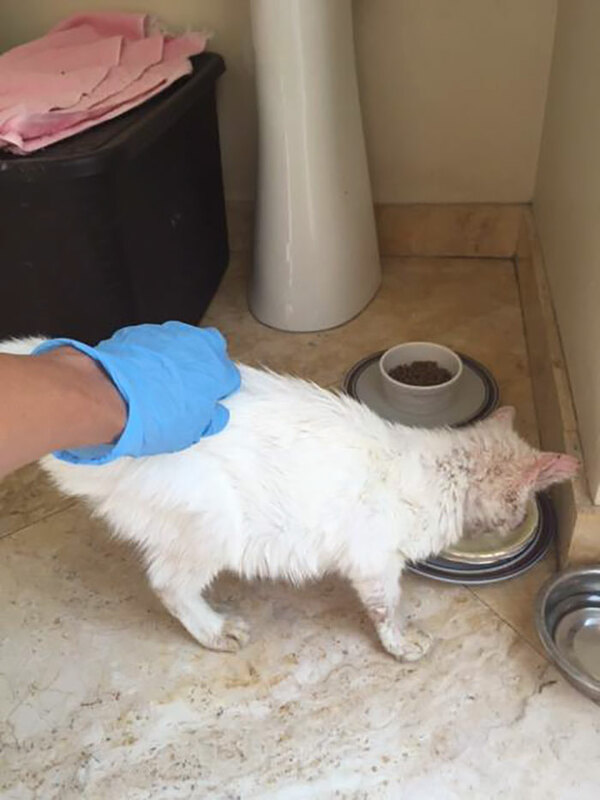 He was immediately treated with antibiotics and coconut oil. His ears needed special attention but eventually the crusts on them were replaced with healthy and pink skin. The skin condition eventually got a lot better and Cotton finally had the chance to open his eyes without something getting in their way. It was a clear sign that everything was going in the right direction. When the people who took care of him saw his eyes, they were stunned because nobody expected what they saw. 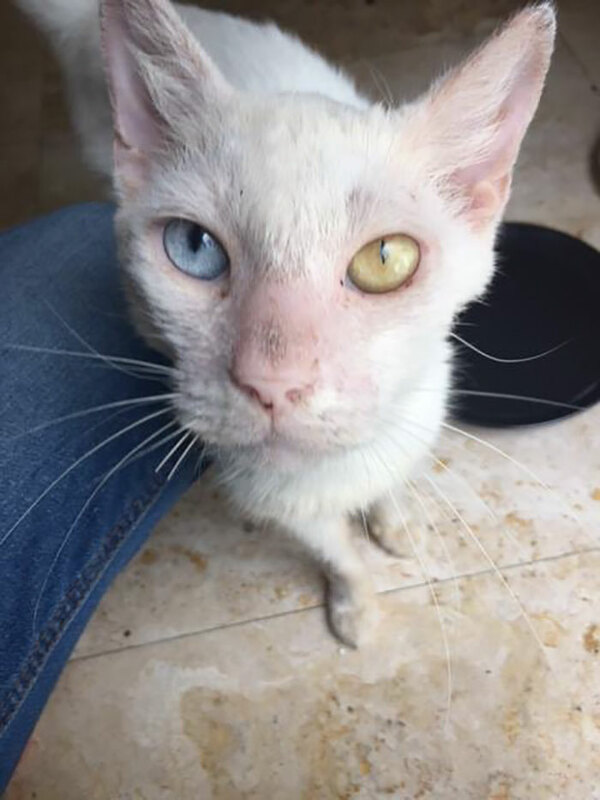 Since a lot of time passed without Cotton being able to open his eyes, the people caring for him thought that he mind not be able to see again, but they did not know how wrong they were. 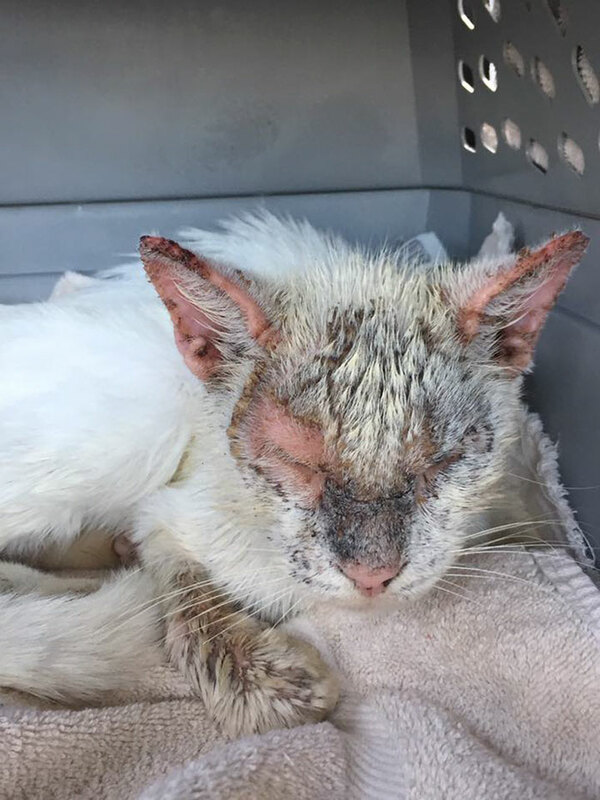 When Cotton finally opened his eyes, the stunning color nobody expected to see and the fact that they were completely intact by his condition was more than a gift for the people who looked after him. Eventually Cotton looked like nothing he used to! He was anemic, extremely underweight and covered in mange but now he looked like a completely different animal. 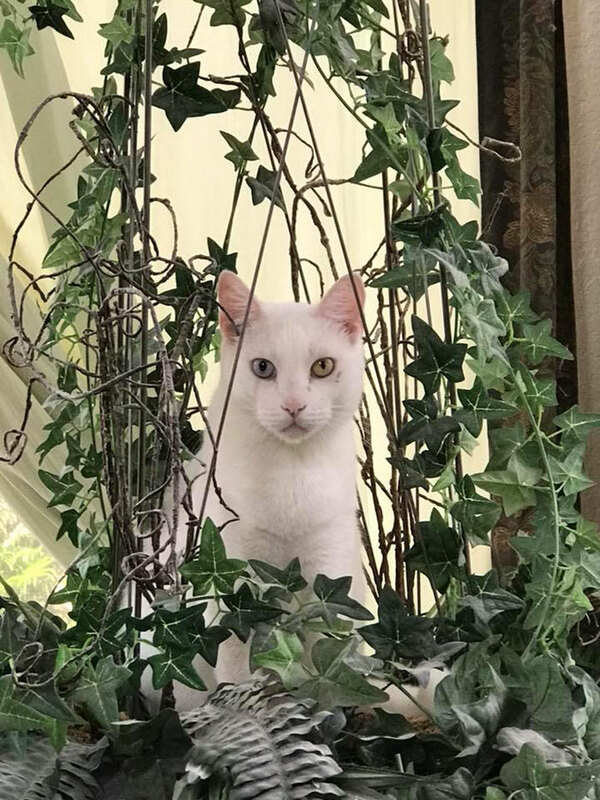 The eyes, one hazel and one blue, were his most distinctive features and as you can see, Cotton looked stunning after his transformation. 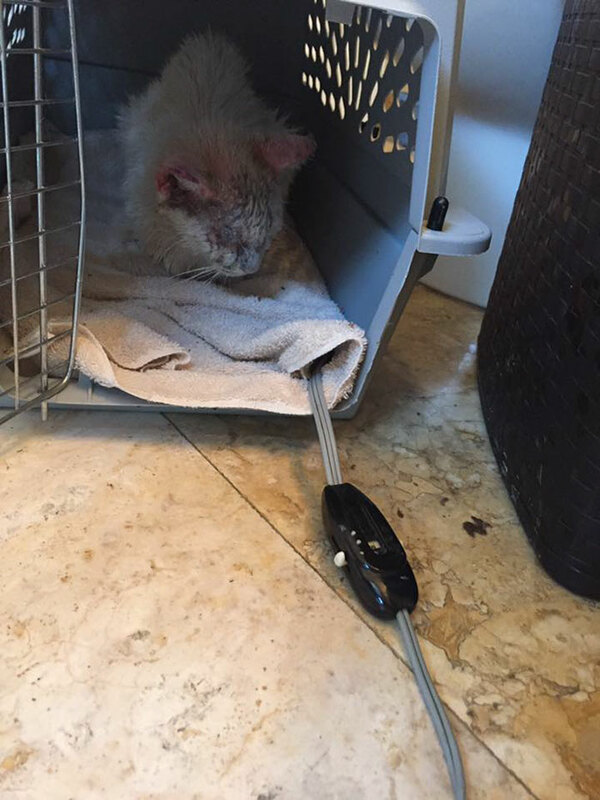 Making a full recovery was not the expected result, but he defied all odds! 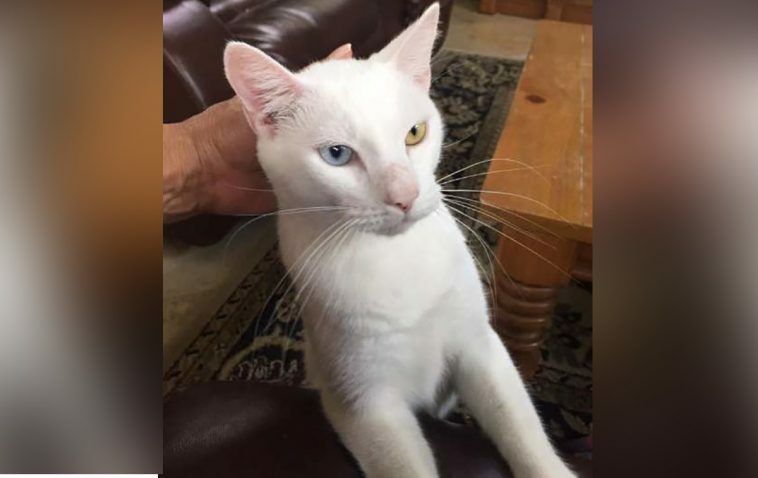 As you can see, Cotton became a truly stunning cat and it is unbelievable what he used to look like before. 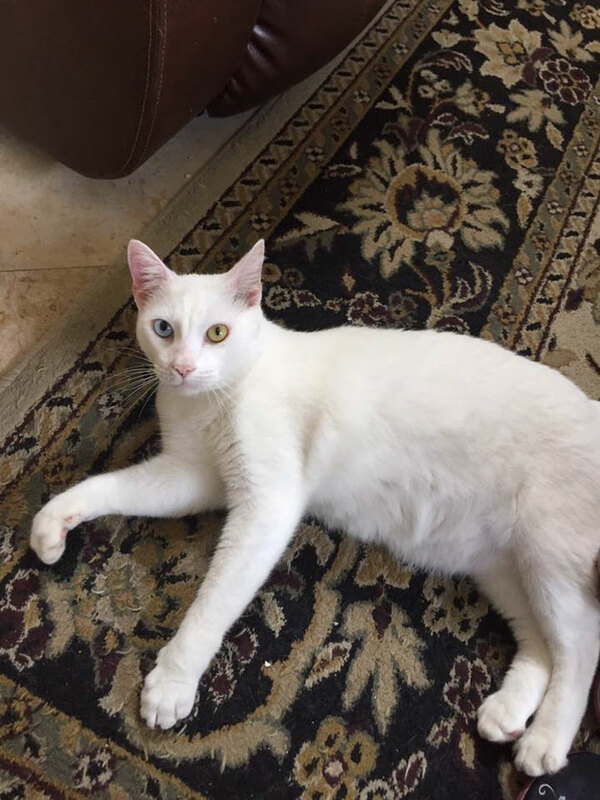 He gained a lot of weight, his fur grew back fully and the stunning eyes he was born with really turned this cat into one beautiful animal! 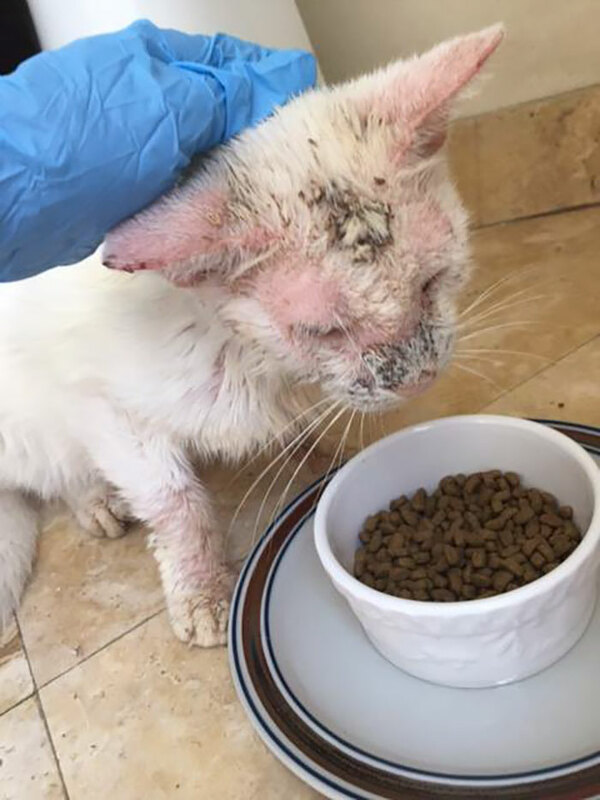 The images of Cotton after he was healed are what people need to see if they have a second thought about helping an animal in need. 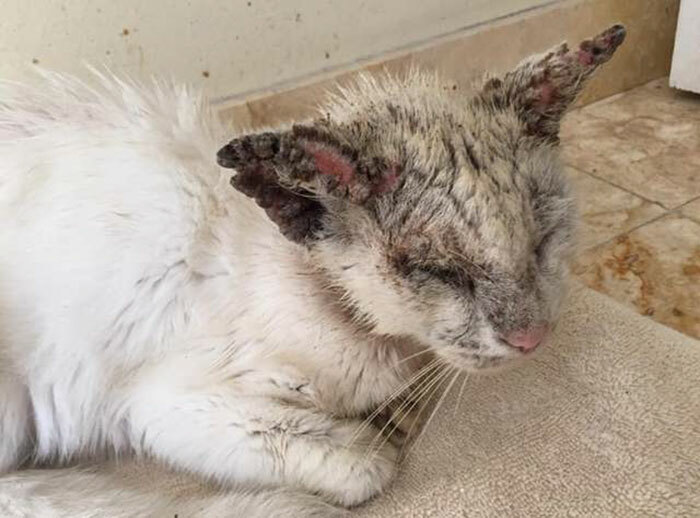 When you see a stray cat in a condition similar to the one Cotton was in, you should not hesitate to help the animal and you can be sure you will get a lot of love in return!